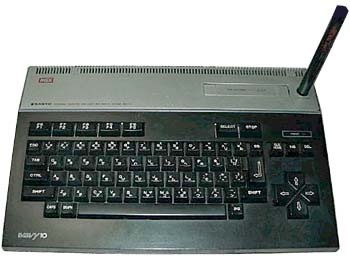 The Wavy /MPC 10 is a classic MSX 1 computer with 32 KB RAM (some sources say 16 KB). Its main particularity is to be delivered with a light-pen. There is of course a connector to use it, and more surprising a hole is placed at the top right part of the case to store the light-pen when not in use! The MPC-100 seems to be the same computer with 64 KB. see more Sanyo Wavy 10 (MPC 10) Ebay auctions !